Those of you who follow this blog will know that I get very excited at any opportunity to visit closed and secret places underground. 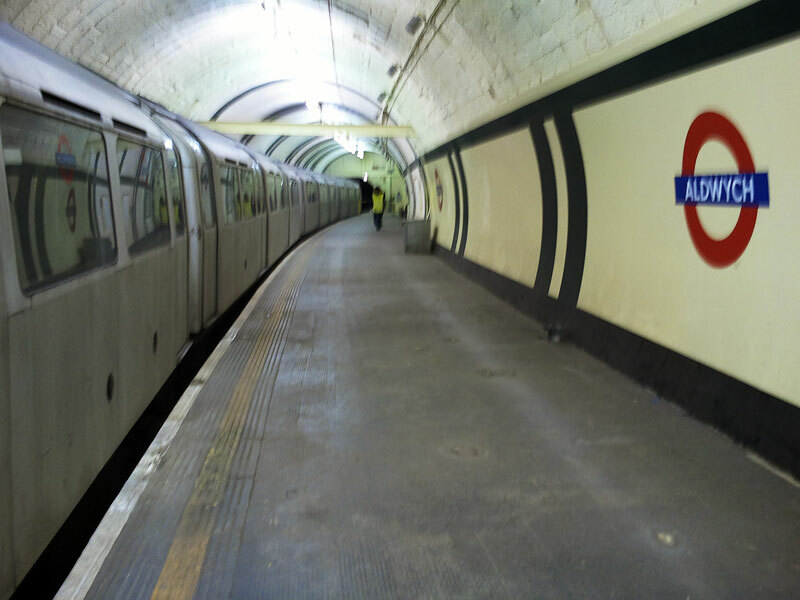 Yesterday the chance to see the closed station of Aldwych tube (formerly The Strand Station) had me leaping out of my sick bed. Opened in 1907 it was never really a success as a station as the original rail plans for this area never really took off. The most significant use of this station was as a bomb shelter during WWII. To start with 300 people took shelter but as the war continued and more Londoners (especially those in the east End) were made homeless, a reluctant government had to install chemical toilets and bunk beds. By then 1500 people were sheltering in this station. After the war a very limited service was reinstated to the station. It was not on any main route, but a branch of its own from Holborn Station, known as a spur. Finally closing in 1994, it is now a Heritage II site with very limited public access. I'd love to visit that... must be fascinating glimpse into history! very interesting story about this station , how strange it must be to visit it ! I wondered wh the platform was so Mary. Shows how often I go t London and use the UG, didn't know it was closed. Love using the taxis as you get to see the city and get your ears 'bashed' on all subjects from 'Maggie Thatcher' to cyclists. Great to see it from the inside. I come past the entrance frequently and it always made me curious to know what it looks like underground. Thank you for sharing it. I wonder how you managed to get to see it, was there a public event or open day or so? You really do get some great opportunities. I'd love using the underground when I visit there and this would certainly be an interesting stop. P.S. I ordered that album you recommended yesterday. Thanks again. What an opportunity! I also love visiting hidden, secret and unknown places! I have a feeling I was there in the 80's. Have you found this perhaps? Glad you got there to catch this pic! I love a secret place. Lucky you getting to visit the station, that's just the sort of thing I would like to see as well! Lucky you! I was taken to Maida Vale to escape the bombs. Wow, you share some amazing places with us, but this is one of the best. Oh you know I'm such a tube geek. I found this really interesting. I visited it when it was open as a functioning station, it was kind of weird because hardly anyone used it. How did you get the chance to go to the platform? Are the lifts working?